Initially, I thought I would be the only person bringing sherry to the EWBC 2008 invitational tasting, but once things got going, I was pleased to see that some Osborne Fino Quinta and the Manzanilla and Fino from Equipo Navazos (Nos 7 and 8 ) had made an appearance. The more the merrier, as far as I was concerned. I think the guys from Vinustv provided the Navazos wines and that Osborne had sent a few bottles of Fino Quinta to Catavino. Navazos are doing really interesting things, but this post is about the wines I took along, which were from Alvaro Domecq here in Jerez. 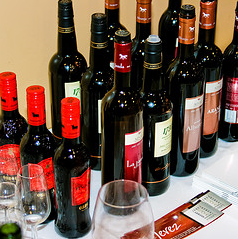 A not insubstantial number of bottles where donated by Alvaro Domecq, and they also sent along a complimentary “copita”, the traditional sherry glass, for each of the participants. Generally, the Alvaro Domecq wines went down well with the EWBC participants, and I was glad of the opportunity to introduce Alvaro Domecq and sherry to those who did not already know either. 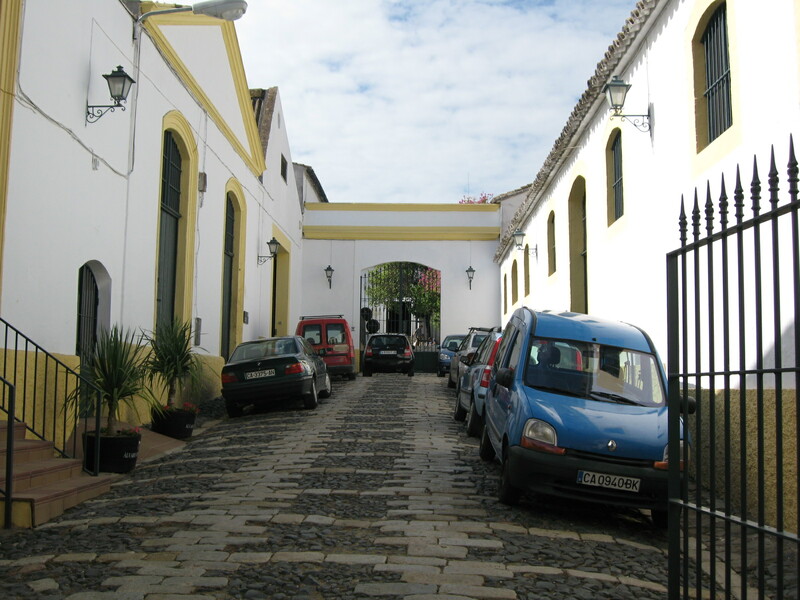 The soleras at Alvaro Domecq date back to 1800, when Antonio María de Aranda started a bodega in Jerez. His son, Fermín Aranda, a famous medical doctor, inherited the business, which subsequently became “Fermín Aranda”. Fermín, in turn, passed the bodega on to his daughter, Pilar Aranda, who inherited the business in 1946. She was a very successful Almacenista, holding her own in a man’s world and producing outstanding wines and vinegars. Almacenistas (from “almacenar”, which means “to store”) are very rare now, but in former times were a major part of the sherry trade. They aged wines in their cellars and then sold them on to the shipping bodegas. In those days, Fermín Aranda tended to sell their wines to Gonzalez Byass. In 1999, the Fermín Aranda business was sold to bullfighter Alvaro Domecq y Diez, head of one of the 5 branches of the famous Jerez dynasty, and became known as “Alvaro Domecq”. Alvaro Domecq had been managing director of the original family firm, Pedro Domecq, in the late 1930s when he was only 20 years old, but left to persue a career in rejoneo, a form of bullfighting. Buying Fermín Aranda was a way for Alvaro Domecq to restore a direct connection with the sherry trade (Pedro Domecq had been merged with Allied Lyons in 1994). In 2007 a controlling interest in Alvaro Domecq was sold to billionaire Manuel Jove, who has built up a portfolio of wine businesses under Inveravante. This new money means new developments and innovations, and already the products are being re-branded. I do have a few issues with the new labels, but this looks to be a step in the right direction. Another great thing, which I only found out about recently, is they have opened a shop at the bodega. It comes with tasting facilities and customers will be allowed to try before they buy. Hooray! Some of you might have read my earlier post about enotourism in Jerez vs Porto. I think this all looks very positive for Alvaro Domecq and their great wines.